(Nanowerk News) Plasmonic structures are metallic nanostructures that can be used to manipulate light on very small scales, so they are investigated intensively for applications ranging from optical circuits and enhanced solar cells to biosensing and imaging. One of the methods to fabricate plasmonic structures is to evaporate metals on dense arrays of small spheres, which results in wide variety of shapes. Researchers therefore need a way to predict the precise shape of these tiny structures so that they can be produced successfully on a commercial scale. This is now possible using a mathematical algorithm developed by a team of researchers led by Xiadong Zhou of the A*STAR Institute of Materials Research and Engineering in Singapore ("3D Profile Simulation of Metal Nanostructures Obtained by Closely Packed Nanosphere Lithography "). Plasmonic devices are based on the wave-like motion of electrons on metallic surfaces. These 'surface plasmons' interact strongly with light of a matching frequency, and can create high-intensity light fields that are suitable for photonic applications. The algorithm developed by Zhou and her co-workers predicts the shape of plasmonic nanostructures evaporated on arrays of nanospheres using a technique called nanosphere lithography (Fig. 1). When the evaporation angle is near-perpendicular to the substrate, the gold evaporates as a thin shell on the surface of the spheres in the form of metal nanocaps. 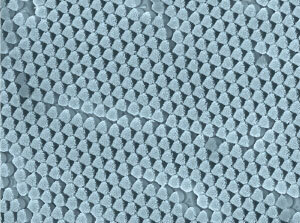 Pyramid-shaped nanostructures can also form on the substrate between the spheres. When the evaporation angle is oblique, only patchy metal nanoparticles form on the top of the spheres. The precise shape of these structures strongly influences their properties that can be exploited in various applications. Gold nanospheres, for example, can be used to focus laser light and destroy tumor cells in cancer therapy. The pyramid-shaped nanostructures, on the other hand, could be used to capture and focus incident light into an underlying device in biosensing devices or antennas. Precise control over these properties is therefore essential. "Our method is an accurate three-dimensional simulation of the metal nanostructures based on space geometry," explains Zhou. She says that the advantage of this approach is being able to accurately forecast the shape of all metal nanostructures, including those parts that cannot be observed using experimental methods. The prediction of the geometric shape of the metal nanostructures, and thus their properties, is crucial to their mass production across a large area, says Zhou. "This [algorithm] solves the bottleneck of fabricating periodic nanostructures for plasmonic applications in an inexpensive and reliable way."